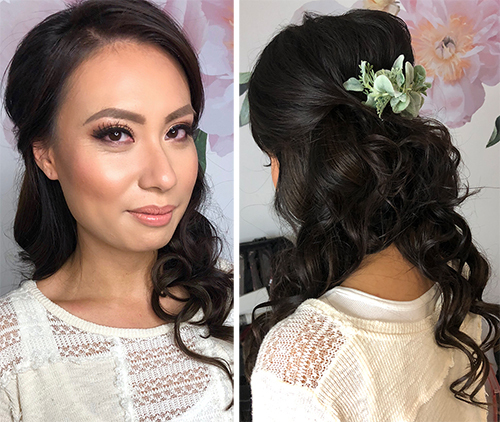 There are lots of things to be excited about when you're planning a wedding but for a beauty blogger like me, coming up with my wedding look was one of my most anticipated. I'm obviously not a Kardashian so getting professional hair and makeup is a pretty rare occurrence, and it's always fun to see what you'll end up looking like when you hand over the reins to someone else. Since I just had my hair & makeup trial, I thought I'd share some of the things I learned! If you decide to go the professional route, a lot of research is involved in picking the right makeup artist/hair stylist for you. I knew that I wanted someone who could do both (two birds with one stone) and they had to be able to offer services for an entire bridal party plus my mom. 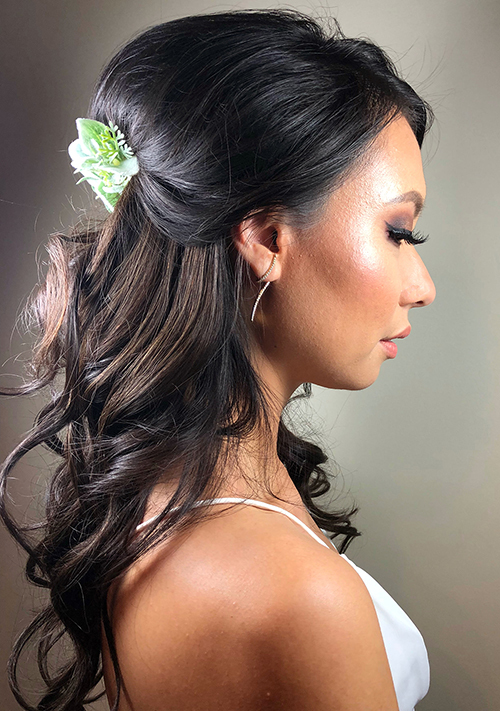 I obtained a list of recommended HMUA from my wedding planner, did my own research for any additional ones I'd read good reviews about, and e-mailed them all for quotes. After comparing quotes, I narrowed down my choices and checked out their work on Instagram to see who might be a good fit. Some brides may want a more natural look or prefer someone who works with a particular ethnicity often (e.g. makeup for Asian features). I ended up choosing Jayna Marie Makeup + Hair because she's won lots of awards, had great reviews, and I liked her work. Once I picked my wedding theme/decor and found my dress, I already had a pretty specific vision of how I wanted my hair and makeup to look. I very rarely wear my hair up so I knew I needed a style that would allow most/all of it to be down. I also love bold eye looks and neutral lips but wanted to play off of my dress and wedding accent colours in the makeup shades. My wedding theme is "west coast greenery" so I purchased a custom greenery comb from Oh! 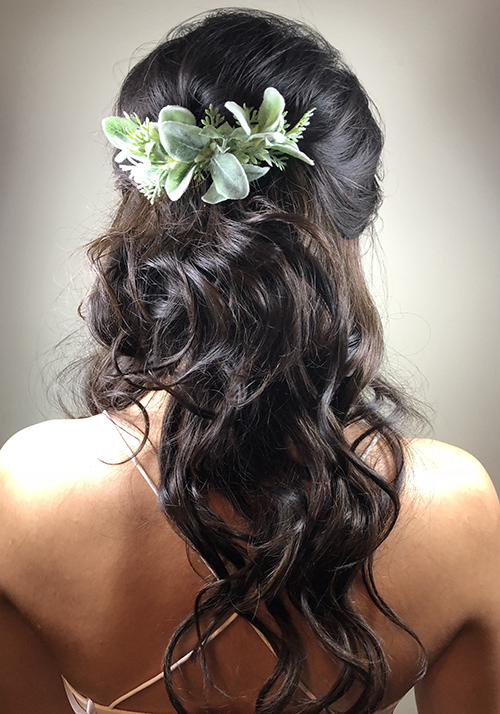 Dina Millinery and combed Pinterest for ideas on how to incorporate greenery into a hairstyle. 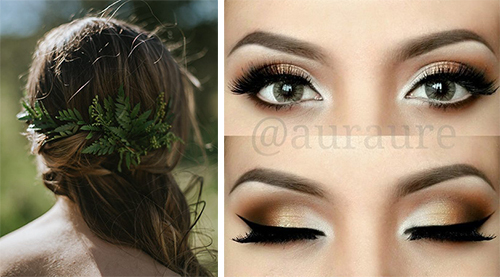 I also decided that I wanted a gold based smokey eye and found some examples that I liked. For my trial, I purposely wore white on top so I'd at least know how the hair and makeup looked against white clothing (when I got home I did change into something a little fancier so I could get the full effect). I also brought all my accessories with me: my greenery hair comb, the earrings I'm planning on wearing, and hair extensions to add volume to my thin hair. After meeting Jayna and talking about my vision, I let her get to work. It's important to trust the professional! Jayna ended up changing the hairstyle slightly from what I originally asked for (everything to the side) because my hair isn't super long and it wouldn't have looked as good. She did show me how it would look that way and left it up to me to decide what I'll end up going with. She also really amped up the lashes (they are double layered and basically triple the length of my natural lashes) which was a pretty huge shock for me when I looked in the mirror for the first time... it's a lot of look but I kind of like it! After you're all fancied up, it's important to test the wear time on your makeup. You want it to really last since your wedding day is long. A lot of people recommend having your trial on the day of your engagement shoot or for your bridal shower so you can really get your bang for your buck, which I think is a great idea. If you have your dress, try it on to get a preview of how you'll look on your wedding day or wear it to an alterations appointment. I didn't really have that luxury due to timing but I did make note of how shiny I got, anything I want to change, and will bring that feedback to Jayna. I also took pictures when I got home to see how the makeup looked outside of Jayna's fancy studio lights. It's so crazy to think that my wedding is just a few weeks away... I hope this post was helpful for any other brides-to-be. Stay tuned for the final look! your hair was so pretty! I love more minimalist hairstyles like this, and the makeup, WOW! stunner!